Admission Charge: April - Sept. Adult €8, Senior/student €6, Family €22, Group with guided tour €6.50. 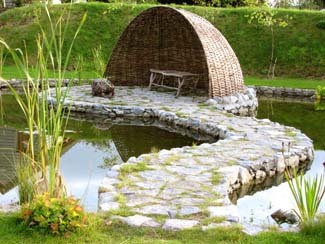 Jenny Beale's beautiful themed garden near Oughterard reflects the Celtic festivals and, in addition to woodland trails, ring fort and stone chamber and has a café that is worth a visit in its own right. A walk through the gardens is a journey through the cycle of the year, each garden representing one of the Celtic festivals: Samhain, Imbolc, Bealtaine and Lughnasa. This seasonal cycle mirrors the cycle of life from conception to old age and death. 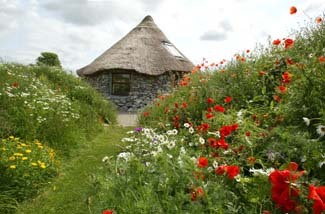 These are wildlife gardens, designed to reflect the West of Ireland landscape and managed to encourage biodiversity. The festival of Samhain (pronounced Sow-en) or Halloween falls on the 31st October and marked the beginning of the yearly cycle for Celtic peoples. This was a time of death and the promise of re-birth, a time of waiting and reflection. It was understood that in the dark silence comes whisperings of new beginnings, the stirring of the seed beneath the ground. In the Samhain garden, the earth, in the shape of a sleeping woman, wraps around a womb-like pool. A figure of leaves cast in bronze rests on an island. The pool is enclosed in a ring of birch trees, reflecting the stark simplicity of the season. This is a place to be still, dream and prepare for the movement of spring. The earth woman is planted with meadow grasses and wild flowers. Imbolc (pronounced Im-ulk) is the old Celtic name for the spring festival on 1st February, now St. Brigit's Day. The birth of lambs and the first snowdrops herald this season of new life. 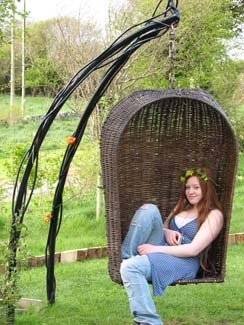 In the Imbolc garden the path leads through hay meadow and orchard trees to a children's glade with its delightful basketwork swings. Further on, a carved triple spiral symbolises Brigit, who is often represented as three sisters or as the three patrons of poetry, smithcraft and midwifery. The great fire festival of Bealtaine (pronounced Belt-an-a) or May Day celebrates the bright half of the year and the coming of summer's warmth. This is the time for sexual awakenings, marriages and the adventures of young adulthood. Diarmuid and Grainne were mythical lovers on the run, and the Bealtaine garden features Diarmuid and Grainne's bed, a grassy hollow facing the sun and surrounded by simple wildflowers. The lovers theme is carried through to the Flame Figures sculpture. A processional way between tall stones has copper flames set into the path and leads to a fire circle, backed by a throne in bog oak and yew. Here, the young adult can claim their personal power and sit as King or Queen in their own life. The festival of Lughnasa (pronounced Loo-na-sa) in early August marks the beginning of the harvest and the transition from summer to autumn. Named after Lugh Lamh Fada, the hero of the mythical Tuatha de Dannan, it is a time of plenty and celebration. Mounds represent the constellation of Orion, which some Celts associated with Lugh. 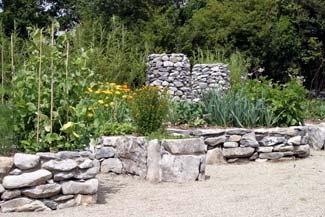 Stone vegetable beds in spiral shapes stand to each side and host an abundance of edible plants: vegetables, flowers and herbs. Two interlinked grassy circles are enclosed with standing stones, making spaces for feasting and dancing. As we approach the end of the cycle it is time to reflect, give thanks and celebrate all that has come to fruition. Three yew trees stand outside the exit from Lughnasa, symbolising the moment of death. The cycle is now complete, and the possibility of re-birth beckons as a new cycle begins. 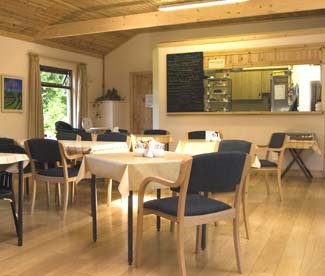 In 2012, Jenny undertook a fine extension of the main shop/café building, which has retained its essential homely character but is now much more spacious with the bright and airy café area overlooking the gardens - where there is also a multi-purpose building which can be used for anything from talks to weddings; and what a charmingly romantic venue for anyone who wants an alternative, slightly bohemian setting for their big day. As before, everything is kept simple in the café and, in fine weather, there is seating outside too. You’ll still find the ever-popular daily soup - chunky, wholesome organic vegetable with thyme, perhaps, a meal in itself with brown bread & butter and good value at about €4.95 - and a choice of quiches. In fine weather the platters and salads are appealing (Brigit's Big Garden Salad Plate, perhaps, available with or without free range chicken, c.€8.95/€7.50), or you might be tempted to try local seafood in a terrine of Kinvara Organic Smoked Salmon with crab (c. €7.95??). Mediterranean flavours suit this kitchen well and many regular visitors will travel especially for Nico's Mezze of olive tapenade, hummus & babaganoush, or the roasted vegetable and hummus Wrap (about €7.50??/€6.95). A few wholesome choices are included for kids too, all at around €3. It’s a lovely place to drop into for afternoon tea, great home bakes include delicious scones with jam & cream, and perhaps a luscious, walnut & apricot carrot cake, which is nutty and moist. Good coffee, tea or tisanes, soft drinks like cranberry or lemon juice and wines by the glass or bottle - just the kind of place you need to know about when exploring the area. Allow time to browse the shop on the way out, as it’s little different from other gift shops, offering an unusual range of hand-picked items that reflect the philosophy of the gardens and include educational books and toys for children. Good coffee, tea or tisanes, and soft drinks like cranberry or lemon juice - just the kind of place you need to know about when exploring the area. Good toilets too, including baby changing facilities, and environmentally friendly waste disposal including reed bed sewage treatment. 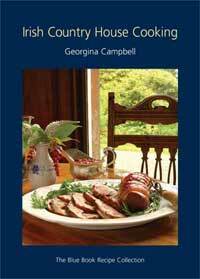 Additional talks and activities on Celtic heritage available for groups. 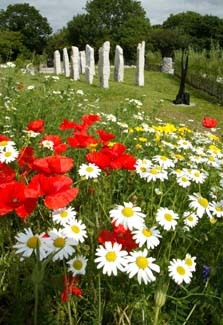 Unique gardens, themed on the Celtic festivals. Family-friendly.